In the following few paragraphs, you can learn some basic and easy changes that allow you to make Mozilla feel more like your internet browser. Currently, most of the development work for Mozilla is done on the technical side, e.g. the implementation of web-standards or the improvement of the already very high stability. Under this light, please excuse the fact that the default Mozilla will not win a beauty contest, but at least it offers powerful options to make it a true gem. 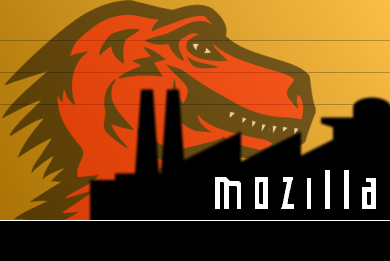 Mozilla has the capability to change its look via so-called themes. The default install comes already with two themes, the Modern and the Classic theme. The Classic theme is based on the user interface (UI) of older Netscape versions, in order to make the transition between those two products easier. However, this legacy is also one of the disadvantages of the Classic skin: whenever new features (such as the tabbed browsing, a powerful way to increase your browsing experience) are developed and released in Mozilla, the Classic theme is not 100% ready for the new features. This is of course due to the fact that the features did not exist in older Netscape versions! The Modern theme on the other hand is the native UI for Mozilla. You should decide for yourself if you like the "look" of this theme, but it definitely offers everything that is needed in case of new features being developed. The mechanism used by the Modern and the Classic skin (skin here is a synonym for theme) inspired a lot of people to create their own theme, such as the Star Trek theme, a "Wooden" theme or an Internet Explorer theme. Click on the "Install Now" or "Install Skin" (or similar) link located on the above pages to download and install your favourite skin. It is recommended that you close and re-start Mozilla after you installed a skin. It is of course possible to have several skins installed on one computer, as we have seen with the Classic and the Modern skin. However, only one skin can be "active" at any given time. The Home Button page has a solution for all those people that complain that the "Home" button in newer Netscape/Mozilla versions is placed on the Personal Toolbar and no longer on the Navigation Toolbar. Go to the page, install the "fix", and be happy ;-). From the webpage: "The RadialContext menu is a hierarchical, context-sensitive pie menu for Mozilla. It offers an alternative to both the normal context menu and mouse gestures. The feeling is very similar to mouse gestures. But there also is a GUI so you don't have to look up what options are available in the given context." Example 1: This great tools allows you to use a left stroke with your mouse instead of clicking on the "Back" button - this makes navigation a lot easier, since you do not have to shift concentration from content to navigation, and back. Concentrate on the content, and navigation will be semi-automatic by mouse gestures, eliminating the need to concentrate on the toolbar, aim for the back button, click on it, and re-center the mouse on the previous webpage, most likely to click on a certain link - with RadialContext, the mouse stays on the webpage, making fast navigation a lot easier. Example 2: If you use the highly recommendable tab functionality available in Mozilla, RadialContext allows you to open, close and arrange tabs a lot faster than regular navigation does. If you want to open a link in a "background tab", allowing you to proceed with the current page and then turn onto the linked page later, a simple "right stroke" with RadialContext does just that: open a link in a new tab, leaving the focus on the tab you are currently reading. Note: It might take you one or two hours to get used to the new navigation style, but in my view, this small investment will make your overall browsing experience not only faster, but also a lot more comfortable, since the browser becomes almost "invisible" once you know how to use the different gestures to access the available functionality. An absolute must! KDP JE's Mozilla Splash Screens includes a splash screen that is based on the Orbit Retro Theme mentioned before. lotekk.net has a ranking that might be useful in order to make up your mind about a splash screen. To actually make Mozilla use the new splash screen, just download (save) your preferred image to your computer. Then, if this is not already the case, convert that image to Windows Bitmap Format (BMP). Finally, save it as mozilla.bmp in the folder where you installed Mozilla (in Windows, this might be C:\Program Files\mozilla.org\Mozilla). 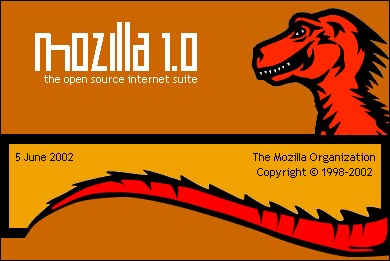 Per default, Mozilla comes with only one icon for all programs: the famous blue lizard as seen from top. In order to increase accessibility, it is advisable to change the icons. This makes it easy to distinguish the mail client, the address book or the navigator window in the task bar with a quick glance. A different sets of icons is available. The "official" page is located at grayrest Icon central. 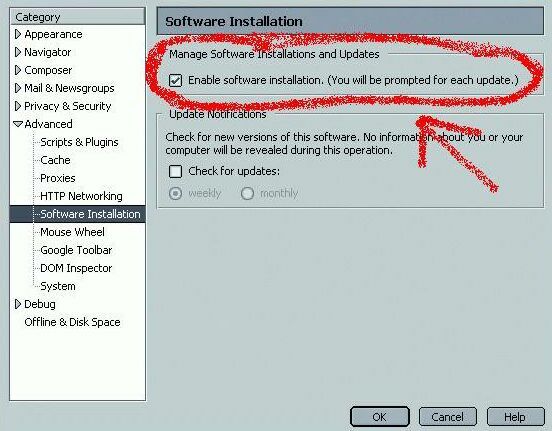 Just click on the installation link located on the page, and do not forget to restart Mozilla afterwards. Another resource for .ico files is lotekk.net which has also loads of other Mozilla-related stuff like splash screens.